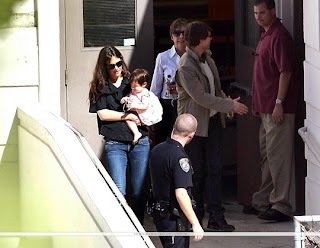 Home » Suri Cruise Out In L.A.
Miss Suri Cruise is a regular in the stands lately to watch her big brother Connor play basketball. Here are a few pictures of Katie holding Suri while she watches the games. Isn’t her smile adorable? Say what you will about Tom, but the last pictures shows him extending his hand to the gentleman that helped them through the back door. Another shot (not pictured here) shows him doing the same to the officer. He seems to be a nice guy with manners…which is hard to find in Hollywood sometimes. Katie Holmes Steps Out With Daughter Suri in NYC!